Tell us a little about each member of the band. Joe: I’m 27 and from the Olney section of Philly. I sing and play acoustic guitar, mandolin, harmonica, jaw harp and kick drum. 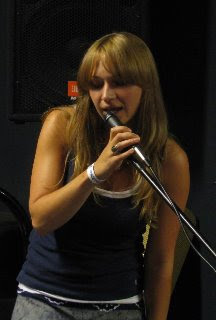 My wife Aria Mascaro (26) also sings and is now six months pregnant with our second baby. 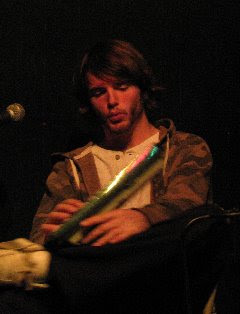 My brother Brendan Duffey (23) plays keys for the band. He plays bass lines with his left hand while filling out our overall sound with his right. Drew Saracco (21) is our drummer, bassist, and electric guitar player from Cheltenham. Each of our songs require a different set of Drew’s skills. He’s also the drummer in a band called Sports. Dan Gallagher (27) is from Bucks County and pretty much takes care of everything else that makes up our sound. He sings and plays guitar, mandolin, and banjo, depending on the song. 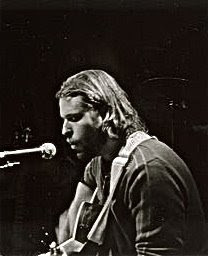 Dan is also the lead singer and songwriter for the band Crow vs Lion. We’ve all known each other for many years but grew separately as musicians, only to come together in the end for the cause of making music. How would you categorize the type of music you perform? What genre would you say it fits into? 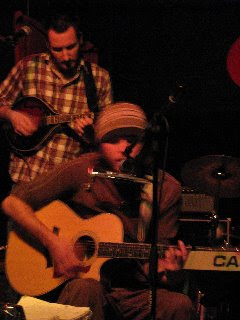 Joe: Jack Firneno of Crow vs Lion once described our music as darkadelic chamber folk. Even though I’m not sure what that means, I think it pretty much explains it in a nutshell. Dan: I’d say there are a couple of things that make our sound unique to a point where we don’t necessarily fit into one genre. As a band I believe each of us feels that every song should be approached differently, meaning that there is no real formula to the way a song is put together. Describe the music you write, record, and perform. Joe: My lyrics are definitely dark, but our chord progressions and arrangements range anywhere from angry to jubilating. Our music is very sarcastic in a lot of ways. I write about wanting to escape reality, my contempt for conformity, my disappointment with humanity, and about being an atheist in a religious world. But our music still tends to make people happy because of the style and delivery. My words are very poetic and metaphoric, but I don’t write songs about love or sunsets. Overall we’re strict when it comes to writing for the sake of simplicity in terms of chord progressions and melodies, but due to the complexity of some of our recordings, we’re not really minimalists. We record our music in Whatevers Clever Studio, which is actually my basement in Jenkintown. 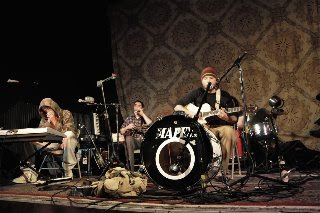 Most of the recordings were finished between 2006 and 2008 before the band was even formed. I write and record the majority of the music and then collaborate with my brother Brendan on piano parts and bass lines. Drew and Dan came in later to add some accents of their own. We record onto my laptop using Protools plugged in through the Mbox, simple as that. My basement is filled with different instruments and we try to get lost in the midst of them while we’re recording. The sound of our recordings could definitely be described as lo-fi. Recording with crappy mics and low quality equipment is what gave it that effect in the beginning, but as we’ve upgraded our studio we’ve tried to hold onto that basement sound and will continue to do so. I’ve always appreciated bands with a more rugged homemade sound. Aria: If you listen closely, our son Grayson makes a few guest appearances cooing or crying in the background of the recordings. He would cry or shriek and we just thought, “Well he can be a part of all this too” and the recordings stuck. Joe: Our live performances are more energetic than our recordings, and obviously more collaborative. Drew wrote all new drum parts for the live shows and plays with much more ferocity than what you hear on the album. 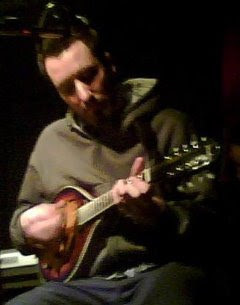 And Dan brings a whole new style with his banjo, mandolin, and guitar than what I had originally recorded. I sit upfront with either my guitar or mandolin and play the kick drum while playing and singing. The heavy kick drum is prominent in both our recordings and our live shows, and me playing it enables Drew to be free to play bass lines or guitar solos when need be. It’s an unconventional set up, but we want it to feel like we’re just hanging out with the audience as if we were in their living room. Who designs the art for your CDs and flyers for your shows? Joe: I’ve been painting and writing poetry for as long as I can remember. So I put those skills to use in Photoshop when creating our ads and promos. I’m a do-it-yourself kind of person and having the band has given me all sorts of excuses to spend my free time writing and creating art. It’s a large part of why I love having the band; it’s like an endless art project. What type of music did you grow up listening to? Joe: I actually grew up on nothing but underground hip-hop. I was into groups like Dilated Peoples, A Tribe Called Quest, Wu Tang, Jurassic 5, Mos Def, Talib Kwali, People under the Stairs, Del tha Funkee Homosapien, Gang Star, Cool Keith, etc. It wasn’t until I discovered Modest Mouse, Interpol, The Shins, Wilco, The Flaming Lips, Radiohead, Okkervil River, Kings of Leon, The White Stripes, and My Morning Jacket that I forgot about rap and dove into discovering new bands to the point of obsession. I now listen to an endless array of musical groups including Dr Dog, Man Man, The Avett Brothers, Langhorne Slim, Bright Eyes, Beirut, Clap Your Hands Say Yeah, Devendra Banhart, DeVotchKa, The Decemberists, The Cave Singers, Ugly Casanovas, and many, many more. Aria: And Joe opened my eyes to all new musicians starting the day we met, it was like someone showed me a world I didn’t know existed, I had pretty much always listened to classic rock: Led Zepplin, The Doors, Janis Joplin, etc. Drew: I was kind of the opposite of Joe in this respect. Nirvana was my favorite band since I can remember and I grew up listening to all of the early 90’s grunge/indie rock (which is still probably my favorite music) like Dinosaur Jr., Sebadoh, Pavement, Modest Mouse, etc. My father also raised me on your typical 60’s acts like The Beatles, Bob Dylan, and Pink Floyd. My two favorite time periods are definitely the 60’s and the 90’s but now I listen to a wide variety of music. At the moment I’ve been listening to: My Bloody Valentine, Ariel Pink’s Haunted Graffiti, The Beach Boys, Grizzly Bear, Daniel Johnston, R. Stevie Moore, Mudhoney, Joy Division, The Rolling Stones, Atlas Sound, The Brian Jonestown Massacre, Scratch Acid, The Vaselines, The Flaming Lips, and the list goes on. My favorite album of all time is “Loveless” by My Bloody Valentine. Bee: Growing up, I was down with a lot of the stuff Joe would play on the boombox like Tribe, Common, and J5. Sublime, Cake, Gorillaz, Nas, The Flaming Lips, Allman Brothers and Gang Starr were early staples of my music diet. Saves the Day awkwardly got me through my awkward years. I love Radiohead. To this day, I always preferred instrumental music and listen to a few classical pianists like Beethoven and Rachmaninoff. Being introduced to Modest Mouse (specifically, Lonesome Crowded West) marked the beginning of an enlightenment period for me in which I got to know a lot of my favorite music today, including The Beta Band, Wilco, My Morning Jacket, Interpol, Man Man… Lately, I can’t get enough of Sound Tribe Sector 9. Dan: When I was real young I heard a lot of Irish Folk, the only music my Dad ever listened to. Later I listened to Nirvana, Wu Tang, Tribe Called Quest, Lost Boyz, The Roots, White Stripes, Pearl Jam, Ben Harper, Beastie Boys, Sublime, The Avett Brothers, Bob Dylan, Beatles, The Rolling Stones, Otis Redding, The Sweetheart Parade, Hezekiah Jones, Bright Eyes, Langhorne Slim, and countless other artists and songs. Any plans to create a music video? Joe: We’d definitely like to create a video for The Short Necked Giraffe. The lyrics are so vivid and obviously comical that we feel almost obligated to do so. Drew is in his senior year at Temple’s film school and he’s majoring in Cinematography so we’d be fools not to take advantage of his skills. Once he graduates in May we’ll start putting something together. But, once again, it’ll most likely be a do-it-yourself type of operation… I’m messing around with Flash now. Aria: It’s gonna be awesome, I’ve already gotten a taste of what’s to come. Have you had any careers not related to music? Joe: As of now, I’m a dad and a marketer for a wholesale ribbon company. Before I decided to go to college when I was 23, I was an HVAC tech from the age of 19 until I graduated. Aria is a mom and a bookkeeper for a construction company. Aria: I have also worked for a small finance company, worked in food prep, and bartended. 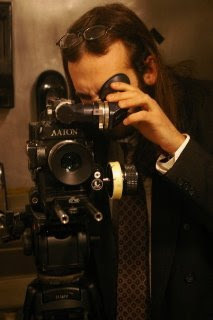 Joe: Drew is a clerk at a local video store and a film student at Tyler Art School. Brendan is a student at Catholic University in DC. Dan: Dan has a day job. How have you handled the business side of being a musician? What are your goals, musically? Joe: We know enough people in the city to fill up the venues that we play, and that family is growing every show. As long as people keep showing up to our gigs, we’ll continue to be able to book great venues. We’ve found that people are more than willing to help us find great places to play as long as we can bring out people to drink the beer. It’s pretty much all networking and if you’re polite and courteous to booking agents, owners, and sound guys, one gig will lead into the next pretty smoothly. Considering we’re an unsigned band that puts together CDs in my basement, there’s not much business involved. We’re really just trying to have fun with the music. I would say that my highest hopes for the band would be to one day share the stage with the likes of Man Man, Dr Dog, or Okkervil River. I can’t really think about anything cooler than that. Dan: Yeah, that would be killer, another one of my goals for the band would be to play at some outdoor festivals; Philly Folk Fest would be a great time. Do you have side projects you work on? Have you collaborated w/ other musicians/ artists in the past? Joe: I’ve produced and recorded music for a few friends: Louis Elliott and Bill Khoury of The Marments, Brian Givnish, Greg Bernt aka John Dillinger, Jared Costa, Adam 12 with The Small Businessmen, and of course Dan’s band Crow vs Lion. You can find all these guys on Myspace. I also put the ads together for The Philadelphia Independent Craft Market, which is run by my friend Julie Roboczi. 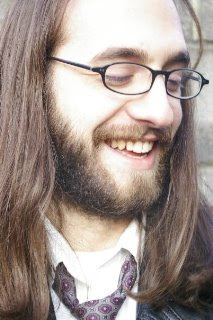 Dan – I write songs and play guitar and banjo in the band Crow vs Lion. Joe and I are thinking about doing some shows in between now and the summer while the band is on hiatus. 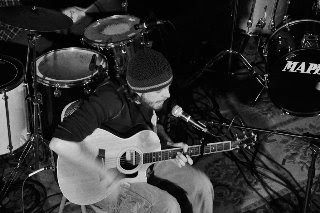 I also collaborate with one of my band members, Jared Costa, who is a solo acoustic artist. Brendan: I am a side project. Have you studied music in school? Joe: Nope. I did take a couple guitar lessons with a friend of a friend and studied piano theory growing up. Never really took it seriously until I was at least 22. Drew: I tried. Well, I auditioned to get into Ithaca College’s music school but was rejected and I am actually happy that I was. Music is something that I enjoy playing with other people for fun and if it became part of my academic curriculum I would have lost my mind and probably my love of playing it. Since then I’ve been trying to forget all of the theory and technical stuff I’ve learned over the years. Brendan: No, I took piano lessons from a young age, and made pretty slow progress until I was 14 and a friend of mine hooked me up with his teacher, who began training me in the Suzuki Method. My development as a musician progressed much faster during that time. Now I take tips and notes from a jazz piano teacher my sister and dad get lessons from, Tim McKinstry. Dan: No, I started when I was around 21, although I wish I had started earlier. Years of writing beforehand made the transition pretty natural. Aria: I was raised around music; it was always being played in my home. I always sang, as long as I can remember. I took piano for about 5 years and I had some voice direction for about a year from an incredible teacher, Anthony Newett (the man’s a genius). I am sure I would have continued, but a fire destroyed our piano, and it was irreplaceable, and so I continued without direction. What do you like best about performing live? Joe: Playing music is just a satisfying experience. It’s just that much better when people are there to appreciate it. I like the shows where the crowd becomes just as important to the energy of the experience as the musicians. Drew: Hitting the drums as hard as I can. Brendan: Performing live as a group shows people who hear our recordings the separate entities within our band as they come together to create good music. I love intensity. 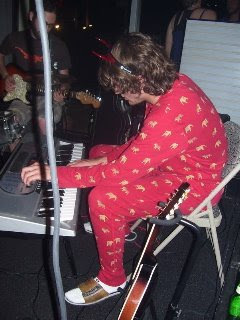 Dan – Watching Drew hit the drums as hard as he can, and watching Brendan play the melodica in pajamas with feet. Aria: I love our families getting together and I love to see my dad at the front of the crowd, rockin’ out with the best of them. He makes it for me. Favorite lyrics to a song? Joe: This answer completely depends on my mood, but for right now it’s Neutral Milk Hotel’s Oh Comely. Drew: The lyrics to the song “Drain You” by Nirvana. Joe: It would be a really frustrating experience to even sort out my top 100 let alone top 5. I could say that the bands that I mentioned above are among my favorites. Drew: Yeah, same as Joe. See above. Joe: Although I’ve been an atheist since 5th grade, God Is Not Great by Christopher Hitchens was pretty compelling. It made me feel like I wasn’t alone. Aria: Dress your family in corduroy and denim, David Sedaris. Love everything he writes. Joe: Salvador Dali, Ralph Steadman, Marcel Duchamp, Picasso… along those lines. I also like a good many Renaissance painters and sculptors, and also Scott Avett and Adam 12. Drew: Francis Bacon is my favorite painter. As far as artists are concerned, I admire a great deal of filmmakers, writers, and photographers. Is there anything that you would like to share with our readers? We just finished a long period of playing out, and our (Aria’s and my) baby girl is due on June 6th. Once she’s all settled in we’ll be back to playing for the summer. In the meantime we’ll be writing and recording in Whatevers Clever Studio, so stop by if you’re in the neighborhood. You can find us on Myspace, You Tube, and Facebook, so keep your eyes and ears open. Thanks to everyone who has been with us so far; the journey has just begun.